Anything can substitute art: George Maciunas in SoHo, a singular exhibition that has brought never seen before Maciunas pieces held by the Jonas Mekas Visual Arts Center in Vilnius, Lithuania to the United States opened at The Cooper Union Gallery in New York on December 11. Lithuanian-born artist, architect, designer, and “chairman“ of Fluxus, George Maciunas (1931-1978, Cooper Union School of Art graduate 1952) radically challenged the idea of avant-garde art – as object, concept, or commodity. Fluxus, an international community of conceptual artists, poets and composers, redefined the role of the artist by substituting art for everyday tasks, experiences, actions, and sensations. The works of Ay-O, George Brecht , Geoffrey Hendricks , Alison Knowles , Larry Miller , Mieko Shiomi , Nam June Paik , Ben Vautier , Robert Watts , and Emmett Williams are included in this exhibition. Also included are rarely exhibited early works by Maciunas: his self-portraits, the entire Atlas of Russian History (1953), Fluxus manifestos, charts, interviews, and plans for artists’ housing in SoHo. “Lithuania is very proud of George Maciunas and that the Fluxus movement had such a profound impact. Every day presents us with opportunities to see things as surprising, unusual or unexpected. These Fluxus moments bring us out of complacency and foster creativity and imagination. We should all have a dose of Fluxus every day to get ourselves fired up for coming up with new ideas and solving issues,“ stated Arturas Zuokas, Mayor of the City of Vilnius. Visitors will also be able to view films by the legendary avant-garde filmmaker Jonas Mekas who was a close friend and colleague of George Maciunas . 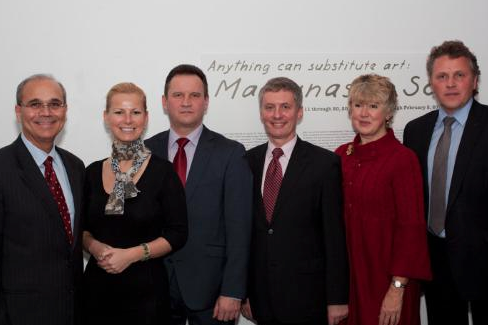 Vice Mayor of Vilnius Jaroslav Kaminski and the Director of Administration of Vilnius, Valdas Klimantavicius, were at the opening to celebrate this important event. Anything can substitute art: George Maciunas in SoHo was created in collaboration with The Jonas Mekas Visual Arts Center and The School of Art at The Cooper Union and was curated byAstrit Schmidt-Burkhardt . It was generously supported by TheCity of Vilnius, Lithuania, The Consulate of the Republic of Lithuania in New York, Anthology Film Archives, Ukio Bankas, Akropolis, and LAWIN. 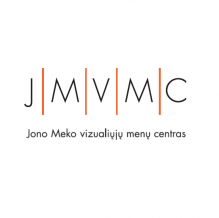 The Jonas Mekas Visual Arts Center, founded in 2007 in Vilnius, Lithuania holds a large collection of Fluxus and is dedicated to promoting the art of the avant-garde.